I have been kept busy, between doing my chores and working in the workshop, I certainly feel better in myself, now I am back doing something I enjoy, I'm not sure why I never thought of doing this before, probably because I didn't think I would be in the Apartment long enough to make it worthwhile. I meant to buy a spade shaft yesterday, I am going to cut it into sections for handles, but for some reason I forgot. Today, I am just going to make some 'push sticks', for my saw table to ensure I keep my fingers, and then I have a bigger project, I am going to make a Router Table, rather than double up with the saw table, then I will have it to use in my workshop at a later date, but this will take some time as it involves precision cutting, which is a bit difficult with what I have available. 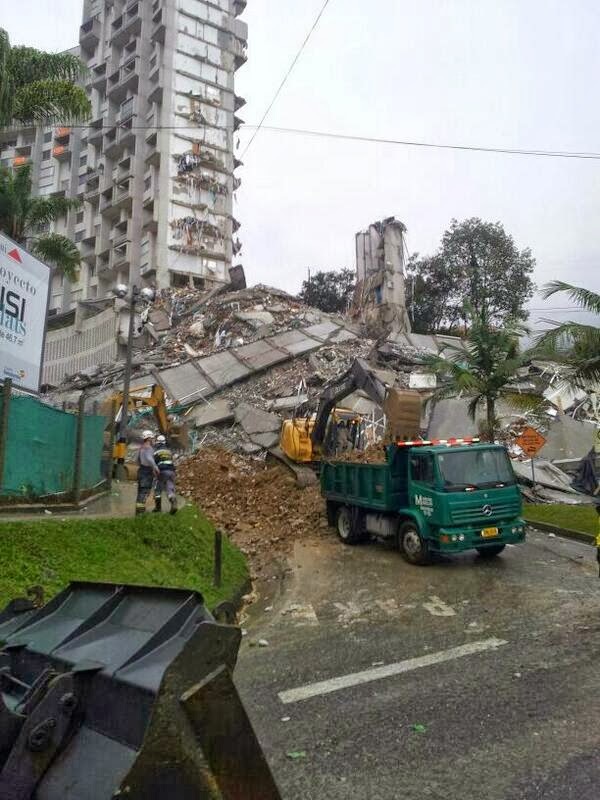 Tragedy struck Medellin last night, yesterday one of six apartment Towers in El Poblado, which is the rich mans zone, and an area where many Expat Americans live, developed major cracks, the Developer asked the Residents to evacuate the building, whilst they did remedial repairs, and told them, it was cosmetic rather than structural, so there was no need to remove personal items. The residents moved out, and workmen moved in, and during the night the Tower collapsed, eleven people are unaccounted for, including workmen and onsite Security. There are rescue workers on site, with three dogs, to try and find anyone still alive. The plot thickens, in that now the Tower No.5 has started leaning, and it looks as if all six towers may come down like a pack of cards, so the Authorities have evacuated everyone. It turns out, that the Local Authority Officer, who signed off the Building Licence, and declared the land fit to build, lives in one of the Towers, which tells you a lot about the situation. 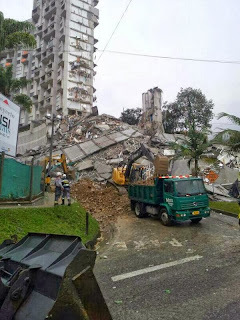 Apparently, there was a similar situation in El Poblado three years ago, where a number of low level houses collapsed when the ground shifted. With all the rain we have had in the last 18 hours, I am not surprised that something of this nature has occurred. I think there will be a number of Officials and members of the Building Company, with questions to answer, and a stretch in the local lock-up! Update: It has emerged today that the People tasked with issuing Building Permits, are not in fact employed by the Local Authority, there are not even any regulations governing them. The Government has announced today, that as a result of this tragedy, laws will be introduced to regulate this profession.